12 lines on a nearby point before good light. As we hit the point we started to get hits and put a fish in the boat. I circled back around and set up to hit the same point but trouble approached. Another guide in a center console drove up within 100 yards of us and proceeded to fish right up on the same point we were fishing! So much for Sportsmanship or courtesy these days. I had no other alternative but to turn and leave the point . I wanted to say something to him but did not want to embarrass him in front of his client. I should have picked up my lines and gone to one of 50 other spots that are holding Stripers but I did not want to sacrifice 12 fresh baits so we continued to work nearby areas. The bite was fairly weak in the rain with the fish hitting the baits short. We put 5 or 6 fish in the boat and relocated to a deeper flat and pulled downlines and boards. After getting a dozen more hits we went and caught more bait and fished up in the river getting hits on secondary points and humps. 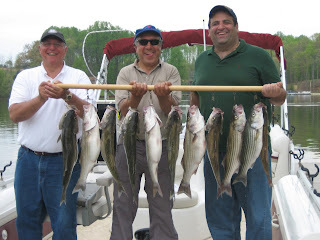 We had over 30 strikes today, clients keeping 11 Stripers, a Cat and a Bass. Overall it wasn't such a bad day, Senior can look forward to enjoying his 'special ' hors d'oeuvre. Thanks for the great time at your office. The day turned out to be greater than at first anticipated and brought us a bundle of fish. Yes, Jeff's catfish included. I would have a great time with or without catching any rockfish. As far as the other dude following you, can you really blame him since he always seems to follow the leader? Take care and look forward to coming down again.